The Oaks Aremisia Tiffany Wall Light Has A Geometric Tiffany Design Glass Shade. The Interiors 1900 Ashtead Tiffany Wall Light has a floral border of autumnal colours. The Interiors 1900 Ashton Tiffany Wall Light is a modern twist on the traditional dragonfly design. The Interiors 1900 Bernwood Tiffany Wall Light incorporates confetti art glass in earthy warm colours. The Oaks Border Wall Uplighter has a Tiffany shade with a vibrant, floral design. The Interiors 1900 Botanica Tiffany Wall Light is in a simple yet elegant Tiffany design with a modern take on colour. The Interiors 1900 Brooklyn Tiffany wall light has bevelled and textured glass combined with rich cream art glass. The Oaks Butterfly Wall Uplighter is a pretty, delicate Tiffany design. The Oaks Caius Medium Tiffany Wall Light has a colourful glass shade with a scalloped edge. The Oaks Camillo Tffany Wall Uplighter is in a squared design with red flowers. The Elstead Classic Craftsman Tiffany Wall Light is part of the Quoizel Tiffany Collectibles family. The Interiors 1900 Clematis Tiffany Wall Light depicts flowers weaving through trellis in shades of Pink and Purple art glass. The Interiors 1900 Dark Star tiffany wall light is designed with iridescent black against pearly cream glass. The Interiors 1900 Dragonfly Tiffany Wall Light is a traditional interpretation of the iconic Tiffany Dragonfly design in natural muted colours. The Interiors 1900 Dragonfly Tiffany Wall Light is a take on an iconic Tiffany design in vivid blues with multicoloured glass beads. The Interiors 1900 Dragonfly Tiffany Wall Light is a take on the iconic Tiffany Dragonfly design in vibrant oranges. The Oaks Dragonfly II Tiffany Wall Uplighter features iridescent dragonflies on the glass shade. The Interiors 1900 Dragonfly Tiffany Wall Light is a take on the iconic Tiffany Dragonfly design in Red art glass. The Oaks Dragonfly Tiffany Wall Uplighter features red-bodied dragonflies. The Interiors 1900 Fargo tiffany wall light is an elegant Art Deco style featuring clean lines and subtle muted colours. The Oaks Flite Tiffany Wall Uplighter has a bold, colourful leaded glass shade in true Tiffany style. The Oaks Flute Tiffany Wall Light has a Cream glass shade with Amber and Red glass buttons. The Oaks Fruit Tiffany Wall Uplighter has a colourful fruit and foliage design. The Oaks Grape Tiffany Wall Uplighter features vibrant Red bunches of grapes. The Oaks Grapes II Tiffany Wall Uplighter is decorated with grapes and vine leaves. The Interiors 1900 Hutchinson Tiffany wall uplighter uses Mackintosh inspired roses and flowing lines. The Elstead Inglenook Tiffany Wall Light is part of the Quoizel Tiffany Collectibles family. The Interiors 1900 Ingram Tiffany Wall Light features a Mackintosh style Art Deco rose. The Interiors 1900 Jamelia Tiffany Wall Light features an intricate design in subtle colours with amber glass beads. The Oaks Jewel Tiffany Wall Uplighter has an Amber leaded glass shade with Clear glass buttons. The Elstead Kami Tiffany Wall Light is part of the Quoizel Tiffany Collectibles family. The Oaks Leaf Tffany Wall Uplighter has a Cream glass shade decorated with Green leaves, Red berries and delicate scrolls. The Interiors 1900 Lelani Tiffany Wall Light is in a bold floral design using vivid red art glass. The Interiors 1900 Lloyd Tiffany wall light is in an Art Deco design with bevelled glass beading to catch the light. 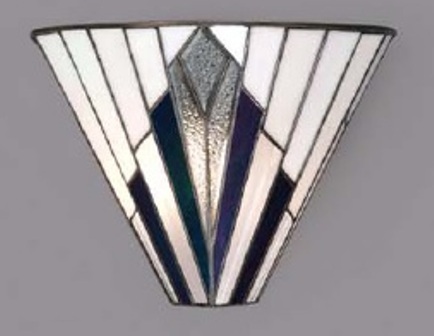 The Interiors 1900 Metropolitan Tiffany wall light has black, white and grey Tiffany style glass in an Art Deco design. The Interiors 1900 Mille Feux Tiffany Wall Light uses many pieces of Cream Tiffany art glass in a geometric pattern. The Interiors 1900 Missori Tiffany wall light has scalloped shaped glass sections in white and browns. The Interiors 1900 Nevada Tiffany wall light is inspired by the heat and golden sands of the Nevada desert. The Oaks Ophelia Tiffany Wall Light has a squared glass shade in a geometric design. The Oaks Orsino Wall Uplighter is in bold, vibrant Reds and Ambers. The Interiors 1900 Pearl Tiffany Wall Light is in a simple geometric classic Tiffany design. The Oaks Peonies Tiffany Wall Light features bold red flowers. The Oaks Sawyer Tiffany Wall Uplighter has a Cream leaded glass shade with soft, muted Green, Amber and Red decoration. The Elstead Stephen Tiffany Wall light is part of the Quoizel Tiffany Collectibles family. The Interiors 1900 Vesta Tiffany Wall Light incorporates scalloped edges and striking colours. The Oaks Viola Tiffany Wall Uplighter is in an Art Deco, geometric design. The Interiors 1900 Willow Tiffany Wall Light incorporates Mackintosh style roses in pretty, subtle colours. Tiffany wall lights provide a warm ambient glow and will grace any room of the home. Luxury Lighting offer a large collection of timeless Tiffany wall lights in both modern and traditional designs, styles and colours. Whether you are looking for a minimal colour pattern or a more bold colourful design we are sure you will find what you are looking for in this range of quality Tiffany wall lights. View online today.